There isn’t much subtlety to this prison thriller, but it’s edgy enough to hold the interest as it follows a fine, upstanding man behind bars and transforms him into a criminal mastermind. If the premise sounds familiar, perhaps you’ve seen Jacques Audiard’s soulful 2009 masterpiece A Prophet. Well, this is more like a blow to the head. And by emphasising the characters’ thuggishness over anything more nuanced, filmmaker Ric Roman Waugh (Snitch) seems to betray the fact that he thinks brutality is inherently entertaining. The story centres on Jacob (Game of Thrones’ Nikolaj Coster-Waldau), a successful banker with a happy home life with his wife and son (Lake Bell and Jonathan McClendon). Then he’s involved in a drunk-driving incident and convicted of manslaughter. And in jail he’s adopted by the white supremacist gang, pushed to commit such nasty violence that he cuts off all contact with his family when he’s finally released a decade or so later. But he also clearly has a plan now, hiding from his tough-guy parole officer Kutcher (Omari Hardwick) to set up a dodgy operation with former prison-mate Frank (Jon Bernthal) and young military veteran Howie (Emory Cohen). Orchestrating all of this is the big boss (Holt McCallany), who is imprisoned for life. Thankfully, the actors all add texture to their characters, bringing them to life even if the movie itself seems uninterested in anything beneath the surface. 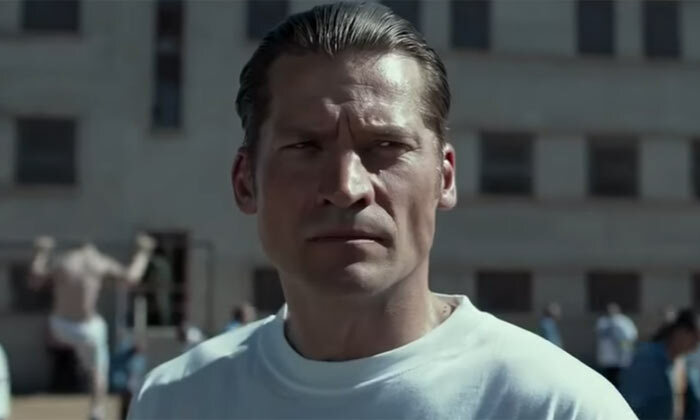 Coster-Waldau is terrific at capturing Jacob’s inner decency and steely survival instinct as he transforms from a slick financial analyst into a muscled killing machine. But of course it’s his internal journey that is far more interesting. Hardwick and Bernthal are solid as tough guys who feel a bit simplistic. But Bell has some properly steely moments as a woman who simply won’t give up on her man even when he tells her to, and Cohen finds some intriguing layers in the quirky, shell-shocked Howie. Along the way, there are quite a few glaring plot holes, mainly in the rush to exaggerated military-style police action. And Waugh’s decision to use a parallel story structure completely diffuses any suspense. By intercutting between Jacob’s early days in prison and the mission he launches when he gets out, we never doubt what will happen. Still, there’s some subtext to undercut the excessively macho atmosphere. And while the central message is seriously shaky (you need to be a killer to survive in this nasty world! ), there’s a driving energy to the film that never lets go.